On May 5, 1945, five days after Adolf Hitler’s sui­cide in the cata­combs beneath his Reich capi­tal, Gen. Dwight D. Eisenhower, Su­preme Commander of Allied Forces in Europe, sent a tele­gram to resis­tance leaders in Nor­way, who passed it to the Com­mander in Chief of Ger­man armed forces in Nor­way, Gen. Franz Boehme. It detailed how Boehme was to get in touch with Allied head­quarters. Two days later Boehme ordered his troops in Nor­way to stand down. Imme­di­ately some 40,000 Nor­we­gian resis­tance fighters (Milorg) in the country mobi­lized and occu­pied the Royal Palace and public places, including Oslo’s main police station. A pre­planned Nor­we­gian admin­is­tra­tion was in place on this date—Victory in Europe (VE) Day—when an Allied mili­tary mission arrived to accept the sur­render of 400,000 Ger­man ser­vice per­son­nel. 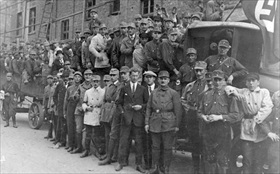 Surren­der terms required the arrest of all Nazi party mem­bers, Ger­man and Nor­we­gian alike, and the intern­ment of all para­military troops belonging to the SS—short for the Ger­man Schutz­staffel (“Protec­tion Squad­ron”). Handing him­self over to Nor­we­gian police was Nazi colla­bo­rator and “Minis­ter Presi­dent” Vid­kun Quis­ling (in office 1942–1945), leader of Nas­jonal Sam­ling, the Nor­we­gian fascist party that supported the German occupation of his country. The new Nor­we­gian govern­ment wanted to avoid lynchings and other extra­judi­cial punish­ment for Nazi colla­bo­rators; for example, those Nor­we­gians who had volun­teered for ser­vice with the Ger­man mili­tary, espe­cially the Ger­manic-SS, as well as police offi­cers in the Sik­kerhets­politiet and Nor­we­gian mem­bers of the Gestapo who may have been involved in tor­ture, exe­cu­tions, and other mis­treat­ment of prisoners. Though extra­judicial retali­a­tion was largely avoided, 28,750 in­di­vid­uals were placed in cus­tody during the first few days. Most of these were quickly released, but over a year later 5,000–6,000 were still in cus­tody, many charged with trea­son, mem­ber­ship in the Nas­jonal Sam­ling (which was made a crime by the Nor­we­gian govern­ment-in-exile in Decem­ber 1944), and sub­ject to various kinds of penal­ties; these included fines, loss of civil privileges, and prison sentences. Nearly 10,300 Nor­we­gians lost their lives during the war or impri­son­ment, and roughly 50,000 were arrested during the Ger­man occu­pa­tion. Of these, 9,000 were con­signed to pri­son camps outside Nor­way. Some 50,000 Nor­we­gians escaped to neighboring Sweden during the war. Left: At the age of 25, future Reich Com­mis­sioner for the Occu­pied Nor­wegian Ter­ri­tories Josef Ter­bo­ven (civil­ian clothes in middle of this 1926 pic­ture) joined the Nazi Party and parti­ci­pated in Adolf Hitler’s abor­tive 1923 Munich Beer Hall Putsch. In 1928 Ter­bo­ven helped estab­lish the party in Essen and became Gau­leiter (party leader) there. Ter­bo­ven was appointed Reich Com­mis­sioner for Nor­way on April 24, 1940, even before the military invasion was completed on June 7, 1940. 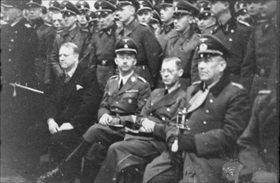 Right: Vidkun Quisling (left), Reichsfuerher-SS Hein­rich Him­mler, Josef Terbo­ven, and Gen. Nikolaus von Falken­horst, com­mander of Ger­man forces in Nor­way on the occa­sion of Himm­ler’s visit to Nor­way in May 1941. Few people were more deserving of death by hanging or a firing squad than Ter­bo­ven. Mostly ignoring Quis­ling’s pup­pet govern­ment, Ter­bo­ven estab­lished a regime of ter­ror in Nor­way, per­son­ally com­manding a force of roughly 6,000 goons, of whom 800 were part of the sec­ret police. Ter­bo­ven’s men were sepa­rate from the 400,000 regular Ger­man armed forces sta­tioned in Nor­way. On May 8, 1945, the day of Ger­man capit­u­lation, he and the com­mander of the Nor­wegian SS com­mitted sui­cide, Ter­bo­ven by blowing himself up in a bunker at his official residence.